Use these simple strategies to up your calorie burn, drop the pounds, and boost the effectiveness of your walks. There's a good reason to be a morning walker. According to a recent study in Journal of Applied Physiology, mental fatigue—a.k.a the brain drain you feel after a long day of working or dealing with family obligations—significantly affects workouts. When your mind is tired, exercise feels more difficult and you can't keep at it as long as you can when you're mentally rested. In the morning, your brain is refreshed from sleeping and not processing thoughts for hours on end, and your walks may feel easier during that time. How to get started: Since most people become mentally fatigued during the afternoon or evening, aim to walk before you start your day. To ease into a morning routine, try leaving your walking gear and some grab-and-go fuel (like a banana) by your bed, so you'll have everything right there when your alarm rings in the a.m. If you're really not a morning person, try strolling during your lunch break, instead. If you regularly keep tabs on how far you walk, it's almost guaranteed that you'll up your activity level. Men and women walked 15 percent more each day when they wore pedometers and recorded their daily steps in a diary than when they just wore pedometers but didn't track their progress, according to a study in Medicine & Science in Sports & Exercise. The walkers who logged their strides also often tried to beat, or at least maintain, their step counts from the previous day. "Wearing a pedometer and recording your step counts gives you feedback on your activity levels, which may lead to personal goal setting and greater confidence in walking," says Stacy Clemes, PhD, the study's author and lecturer in human biology at Loughborough University in Leicestershire, United Kingdom. 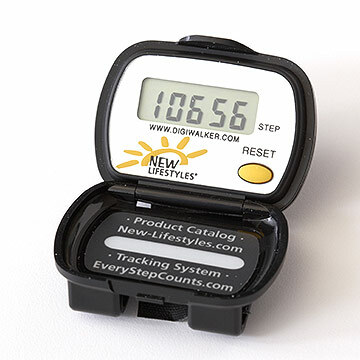 How to get started: Purchase a pedometer and start keeping track of your daily steps. Aim for 10,000 a day, but don't get discouraged if you're not there yet—the average woman takes about 5,000 daily. To boost your number gradually, add 500 more steps a day, every few days, until you hit the magic 10K. Here's a good excuse to download some new songs: A recent study from the Journal of Sports & Exercise Psychology found that music can literally move you. When people walked in time to fast-tempo music (approximately over 120 beats per minute) with a strong rhythm, they walked 15 percent longer than those who sweated in silence. Why the big increase? Music improved participants' moods, motivated them, focused their attention, distracted them from feeling tired for longer periods of time, and helped them to move more efficiently, according to lead study author Costas Karageorghis, PhD, of Brunel University in West London. How to get started: Use music to maximize your walking workouts by loading up your MP3 player with rock or pop songs that are around 120 to 145 beats per minute. To calculate beats per minute, simply count the beats during 15 seconds of a song and multiply that number by four. Sound too complicated? We've already done the math and created walking playlists for 15-, 30-, and 45-minute walks, plus playlists for walking at easy through speedy tempos. Add some inclines to your walk and you'll torch some serious calories. A 150-pound woman walking at 3.5 miles per hour on level ground will burn 132 calories in 30 minutes. But walking at the same speed on a five percent grade, she'll burn 171 calories in a half-hour. "Walking up hilly terrain requires the muscles to produce more force to propel the body upward, which helps you burn more calories," says Julia Valentour, spokesperson and programs coordinator for the American Council on Exercise. Bonus: Walking uphill may boost bone density and will tone and strengthen your quadriceps, glutes, hamstrings, and calves. How to get started: Once you've established a steady routine of walking on flat terrain, try walking hilly routes one to two times a week. (Avoid walking those routes on back-to-back days so your body can recover.) If there are no hills in your neighborhood, go to a local school and climb up and down the stadium steps, or try the stairs in an office or apartment building. 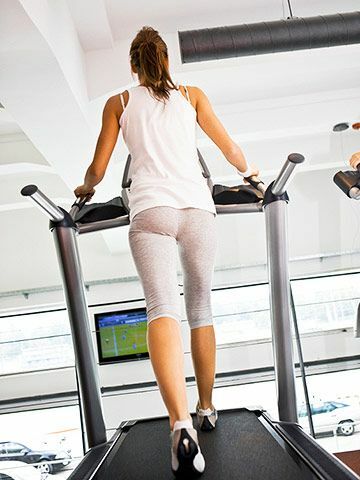 At the gym, hop on a treadmill and add an incline. Start with a five-minute walking warm-up with no incline, then increase to an incline you can sustain (anywhere from five to 10 percent) for 60 seconds. Drop back down to no incline for 1.5 to two minutes so you can recover. Work your way to walking uphill for 60 seconds and resting for 60 seconds. Repeat this several times during your workout. "The incline should challenge you but not so much that your breathing and heart rate accelerate rapidly," Valentour says. If you feel like you're always scrambling to get your walks in, setting goals may provide the structure you need to stick to your exercise plan. A study published in the American Journal of Preventive Medicine found that workplace programs that encouraged employees to set time-specific, realistic fitness goals (such as how many steps or how long they'd exercise daily or weekly) got twice as many people to exercise regularly than a control group that set no goals. 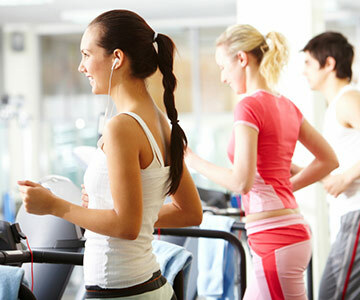 According to study author Rod K. Dishman, PhD, professor of exercise science at the University of Georgia, in Athens, Georgia, clear objectives helped goal-setters know what they were working toward, and this motivated them to make time in their schedules for exercising. How to get started: Set yourself up for success. Choose a goal that's challenging but also attainable. In other words, don't make it so grandiose that you can't achieve it, like upping your daily steps from 5,000 to 10,000 in one week, or walking five miles a day, five times a week. When setting your goal, also be sure to decide exactly how much you plan to bump up your activity level and in what period of time, says Dishman. For example, you might increase your exercise time by 10 percent each week, or aim to take 1,000 more steps a week. To make that even more doable, create daily goals that will help you achieve your larger one. If you're aiming to walk 1,000 more steps over the week, aim to walk about 150 extra steps a day. Every two weeks, evaluate your progress and readjust, if necessary. 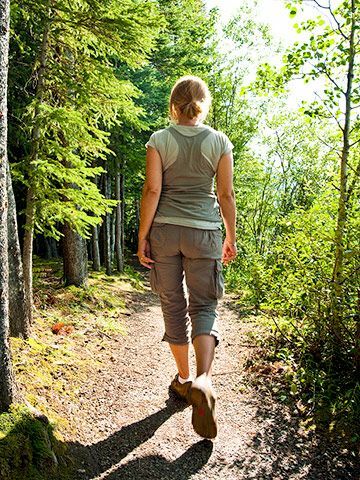 You might have a favorite walking route, but you should literally veer off the beaten path, especially if you're trying to lose weight. Eventually, your body gets used to your everyday workout (it's called a "routine" for a reason), and your weight loss and strengthening gains will stall. German researchers found that untrained individuals who did a three-day-a-week jogging/walking program saw cardiovascular fitness improvements for the first six months, but after that, nothing, according to a study from Medicine & Science in Sports & Exercise. To keep progressing, researchers recommend changing your workouts so you continue challenging your body. How to get started: Boost the intensity of your workouts. Another recent study in Medicine & Science in Sports & Exercise found that obese women who did three high-intensity sessions of walk-jogging or walks plus two low-intensity walks a week lost substantially more weight over 16 weeks than obese women who did either low-intensity exercise five days a week or nothing. Intimidated by the sound of "high-intensity" exercises? Don't be. According to study author Arthur Weltman, PhD, director of exercise physiology at the University of Virginia, in Charlottesville, Virginia, it's "something anybody can do, as it's based on your own capabilities." He suggests you try this: Walk at an easy pace for five minutes. Then, increase your pace so that walking feels hard. (For example, if you're measuring your exertion on a scale of 1 to 10 with one being effortless and 10 being super-hard, you should be working between 5 and 7.) Hold that pace for the majority of your walk—if you're walking for 30 minutes, for example, you would try to maintain that pace for about 20 minutes—before cooling down with easy walking. Repeat three times a week (every other day). Feeling like your workout is too tough could leave you with an unexpected consequence: Weight gain. A study in the journal Obesity found a connection between how difficult formerly overweight women perceive exercise to be and how much weight they regain. Women who had completed a year-long diet and fitness program took a treadmill test that measured how hard they thought they were working and how much they actually exerted themselves. 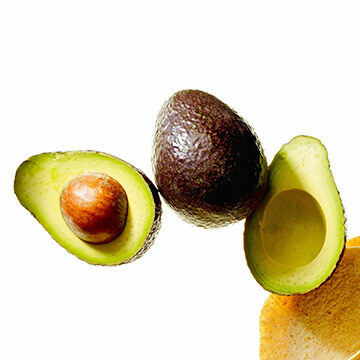 A year later, the women who found the test most difficult had gained more weight—an average of 12 pounds—than those who thought it was easier. (How hard they actually worked out didn't predict weight gain.) The reason for their extra pounds? Because of their negative experiences with exercise, the weight gainers simply worked out less. How to get started: Find a way to make your walks fun. "If you're slogging through something you don't enjoy, you won't stick with it," says lead author David W. Brock, PhD, assistant professor of exercise and movement science at the University of Vermont, in Burlington, Vermont. However, if you turn your walks into something you look forward to, you'll be more likely to work out regularly. Try inviting your best friend to stroll with you once a week, or take a new route through an area with pretty scenery.